Eighteen weeks of training and 26.2 miles later, we made it to the finish line of the 37th Marine Corps Marathon. Despite incoming Hurricane Sandy, we ran alongside some 30,000 runners from every state and 54 countries on Oct. 28. The turnout was the largest participation in the event’s 37-year history. Staff Sgt. 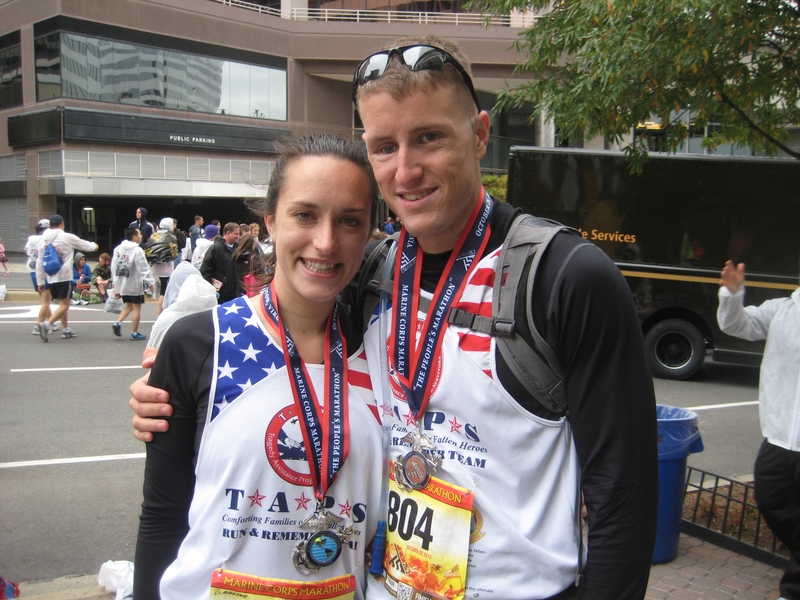 Jeremy Boutwell and I finished the 37th Marine Corps Marathon on Sunday, Oct. 28 in four hours and 25 minutes. Despite months of preparation, healthy eating and plenty of rest during the weeks leading up to the race, I forgot how hard running a marathon can be. My running partner, Staff Sgt. Jeremy Boutwell (ret. ), and I finished the race in 4 hours and 25 minutes. We ran a little slower than we anticipated (due in part to a few too many pit stops and windy weather) but still crossed the finish line well under our original goal of five hours. And though the race might have been packed, we still managed to spot a few familiar faces that came out to cheer on runners despite the dreary weather. We saw Maj. Gen. Richard Lake, deputy director of the National Clandestine Service for Community Human Intelligence, Central Intelligence Agency, and Sen. Patrick Leahy of Vermont twice during the race. When we told her it was Gen. Lake, her eyes got wide and her response said it all. It was one of several moments along the course that helped us push through the pain we started to feel at mile 20. For those last five miles, rather than thinking about crossing the finish line, our strategy became focused on making it to the next water station. Two miles from the finish, the idea of completing the race started to feel real. We could hear the crowds cheering at the Iwo Jima Memorial and the words of a passing runner helped us regain our momentum and pick up some speed after we stopped to walk. “Doc would be proud,” the runner said. She was referring to the photo of Army Sgt. David Almazan, whose photo was on the back of my singlet. Almazan was killed in Iraq in 2006 when his humvee was hit by an IED three weeks into his deployment. When we crossed the finish line, as Marines and thousands of spectators cheered, we couldn’t have felt better. It was an emotional moment, one that I wished Almazan’s wife, Salina, could be there for, but I felt humbled and proud to be a part of it. Almost nine years after Jeremy was wounded — and countless surgeries later — he completed his first marathon. It was something he thought he’d never be able to do during his long months of recovery after the attack. The only thing that felt better than crossing the finish line and having a Marine place a medal around my neck, was seeing Jeremy call his family to tell them that he had finished the race. I knew that as long as 26.2 miles felt for me on Sunday, his journey and theirs had been a lot longer. Kelly Gustafson of The Medill News Service caught up with us before and after the race. She put this video together after the Marathon.